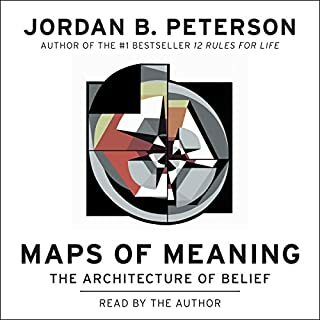 Jordan Peterson says this work is a tough read. I beg to differ. After churning though what feels like ancient tomes of philosophy for the past months, listening to this feels absolutely exhilarating. Lets go through some points - 1. Penned in my native language (the awkward cadence of translation is not to be found here!) 2. Succinct scientific approach to some of the most mulled over epistemology and moral, and general philosophy questions of all time. Compared to the works of Nietzsche I've combed through - though absolutely packed with brilliance - the relative ease of understanding in this book feels like thick, viscous, pure intellectual heroine!!!! I do not say this lightly! I love how Peterson nests Psychology with it's undoubtedly kindred discipline, philosophy. As a psychology major, hearing him use the terminology I've learned really helps integrate the knowledge into my sort of "mushy grey database". Eloquently put, yeah. Sorry, needless to say I'm a bit excited over the book. Currently I'm 6 and 1/2 hours in, and going strong. Thank you so much for this insanely erudite and lucid work! Please though, you don't need to be so humble!